Members of TCU’s Model UN Club flash the Frog sign at the National Conference in Washington, D.C. The group won “Outstanding Delegation” honors. Now in its 10th year, the program is a joint effort between Student Development Services and the Department of Political Science. Participants act as representatives of a UN member-state and thoroughly research the policies of their designated country on such issues as international trade and development, terrorism, human rights and the environment. The “delegates” then compete with students from across the globe at national and international Model UN conferences, where TCU teams continuously bring home top honors. TCU’s team has competed in Model UN conferences in New York and Washington, D.C., every year since 2004 and has been to six international conferences, noted Eric Cox, associate professor of political science. 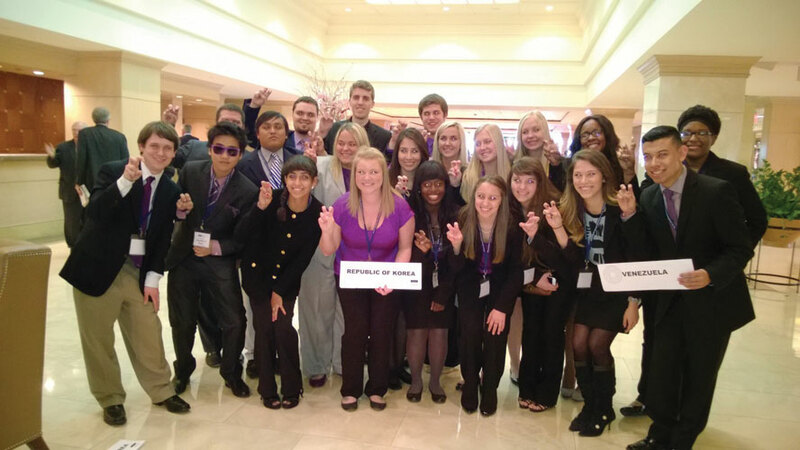 The TCU group that competed in Washington in October returned with “Outstanding Delegation” honors — the highest award. While most participants are political science majors, the program draws from all corners of campus. There are three ways to participate in Model UN at TCU. At the “club” level, students prepare to compete at the fall National Model UN conference in D.C. Cox helps with logistics, but student leaders do most of the work on their own. Club members meet weekly for an hour. Students who want to participate in the Model UN conference in New York must apply in the spring a year before they want to go and are required to take two courses at TCU — the fall class covers the UN in general while the spring class focuses on preparation for the conference. Cox said the fall class is probably one of students’ hardest in terms of academic expectations, while the spring class includes a writing emphasis and requires students to write a position statement paper that is likely one of the most research-intensive assignments they will have at TCU. “The sheer amount you have to know to write that paper is remarkable,” he said. After participating in the New York conference, students qualify for an international trip. Past TCU Model UN students competed in Xi’an, China, and Quito, Ecuador. This year they traveled to South Korea over Thanksgiving. Overall, TCU’s program averages 60 to 70 students each year. This fall, 23 went to D.C. and 11 to South Korea, while about 34 are expected to compete at the spring New York conference, which will host more than 5,000 college students from around the globe. The TCU Model UN program helps participants sharpen their negotiating, public speaking and writing skills — as well as their confidence. TCU Model UN alums have gone on to law school, grad school and the Peace Corps. There have been Teach for America fellows, Fulbright Scholars to the Philippines, Germany and Thailand, and other major fellowships. Alums have also found jobs within the Department of Defense as well as the Democratic, Republican and Libertarian parties. Ellen Brown ’13, a political science major from Littleton, Colo., said Model UN has given her more “life skills” than any other class at TCU. Brown has been to two New York conferences, where she represented Iran and Georgia, and served as co-head delegate for the South Korea conference in November, where TCU’s team represented the United Kingdom and the Federal Republic of Nigeria. She will miss the spring New York conference because she is graduating early.